, Abou-Ali- Alhussein-Ben-Abdoullah, EfiN-SiNA, called Avicenes, the prince of Arabian philosophers and physicians, was born at Assena, a village in the neighbourhood of Bokhara in the year 980. His father was from Balkh in Persia, and had married at Bokhara. The first years of Avicenna were devoted to the study of the Koran, and the belles lettres, and so rapid was his progress that, when he was but ten years old, he was perfectly intelligent in the* most hidden senses of the Koran. Abou-Abdouliah, a uative of Napoulous in Syria, at that time professed philosophy at Bokhara with the greatest reputation. 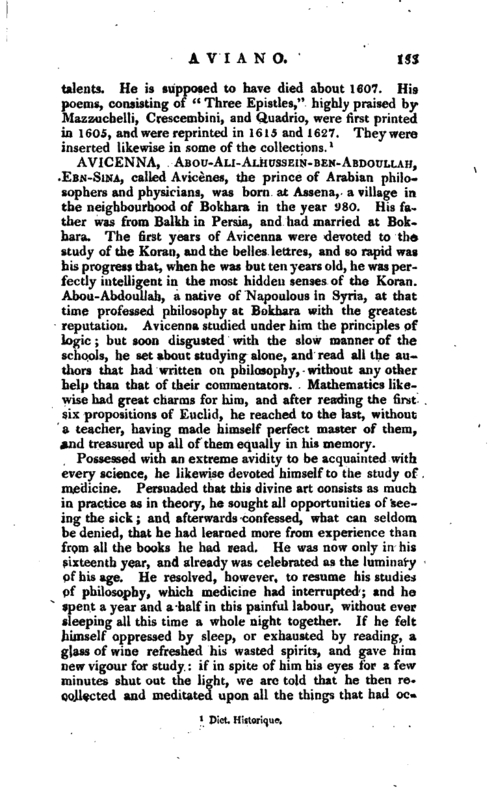 Avicenna studied under him the principles of logic but soon disgusted with the slow manner of the schools, he set about studying alone, and read all the authors that had written on philosophy, without any other help than that of their commentators. Mathematics likewise had great charms for him, and after reading the first six propositions of Euclid, he reached to the last, without a teacher, having made himself perfect master of them, and treasured up all of them equally in his memory. Several great princes had been taken dangerously ill, and Avicenna was the only one who could know their ailments, and administer a remedy. His reputation consequently increased daily, and all the kings of Asia desired to retain him in their families. Mahmoud, the first sultan of the dynasty of Samanides, was then the most powerful prince of the east. Imagining that an implicit obedience was due by all to his will, he wrote a haughty letter to Mamoun, sultan of Kharism, ordering him to send Avicenna to him, who was at his court, with several other learned men but as Avicenna had himself been used to the most flattering distinctions, he resented this imperious command, and refused to go. The sultan of Kharism, however, obliged him to depart with the others who had been demanded. Avicenna pretended to obey, but, instead of repairing to Gazna, he took the road to Giorgian. 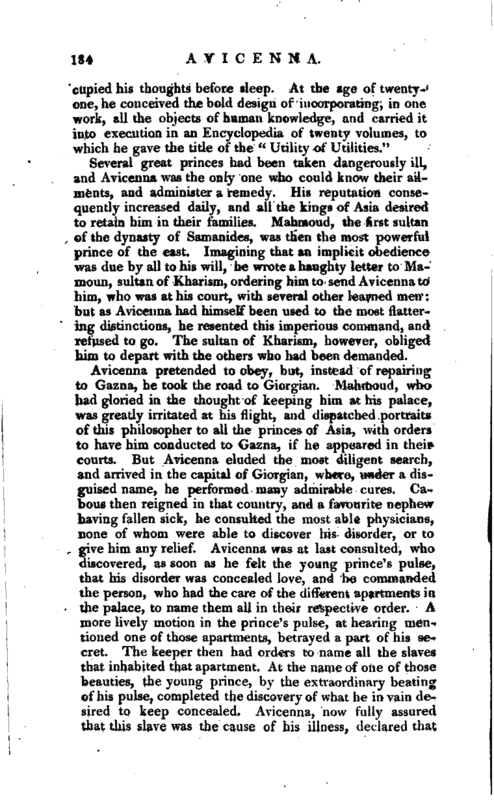 Mahmoud, who had gloried in the thought of keeping him at his palace, was greatly irritated at his flight, and dispatched portraits of this philosopher to all the princes of Asia, with orders to have him conducted to Gazna, if he appeared in their courts. 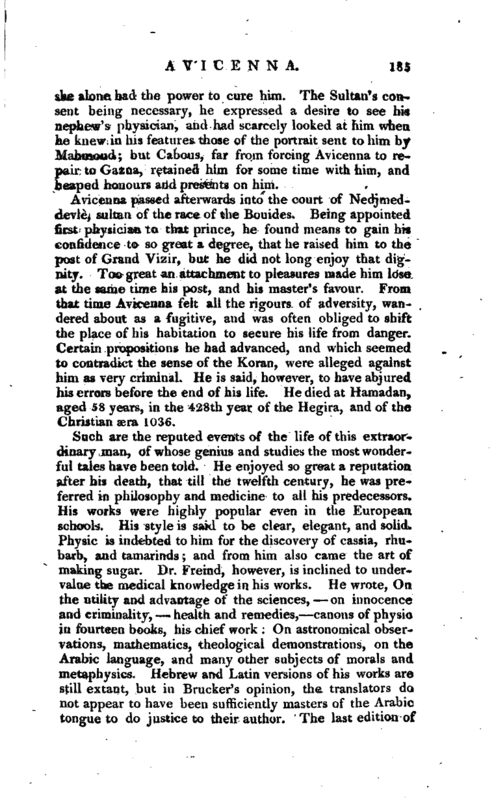 But Avicenna eluded the most diligent search, and arrived in the capital of Giorgian, where, under a disguised name, he performed many admirable cures. Cabous then reigned in that country, and a favourite nephew having fallen sick, he consulted the most able physicians, none of whom were able to discover his disorder, or to give him any relief. Avicenna was at last consulted, who discovered, as soon as he felt the young prince’s pulse, that his disorder was concealed love, and he commanded the person, who had the care of the different apartments in the palace, to name them all in their respective order. A more lively motion in the prince’s pulse, at hearing mentioned one of those apartments, betrayed a part of his secret. The keeper then had orders to name all the slaves that inhabited that apartment. At the name of one of those beauties, the young prince, by the extraordinary beating of his pulse, completed the discovery of what he in vain desired to keep concealed. Avicenna, now fully assured that this slave was the cause of his illness, declared that | she alone had the power to cure him. The Sultan’s consent being necessary, he expressed a desire to see his nephew’s physician, and had scarcely looked at him when he knew in his features those of the portrait sent to him by Mahmoud but Cabous, far from forcing Avicenna to repair to Gazna, retained him for some time with him, and heaped honours and presents on him. Avicenna passed afterwards into the court of Nedjmeddevle, sultan of the race of the Bouides. Being appointed first physician to that prince, he found means to gain his confidence* to so great a degree, that he raised him to the post of Grand Vizir, but he did not long enjoy that dignity. Too great an attachment to pleasures made him lose at the same time his poSt, and his master’s favour. 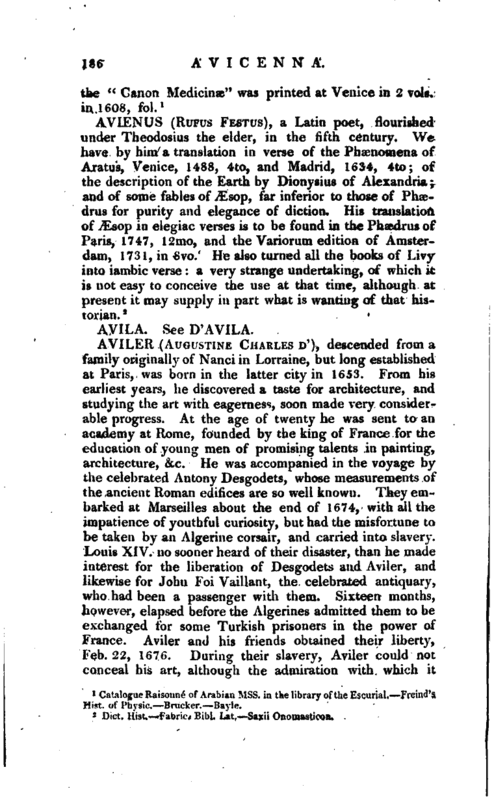 From that time Avicenna felt all the rigours of adversity, wandered about as a fugitive, and was often obliged to shift the place of his habitation to secure his life from danger. Certain propositions he had advanced, and which seemed to contradict the sense of the Koran, were alleged against him as very criminal. He is said, however, to have abjured his errors before the end of his life. He died at Hamadan, aged 58 years, in the 428th year of the Hegira, and of the Christian ara 1036. Catalogue Raisonnd of Arabian Mss. in the library of the Escurial. Freind’s Hist, of Phys.c. Brucker. —Bayle.